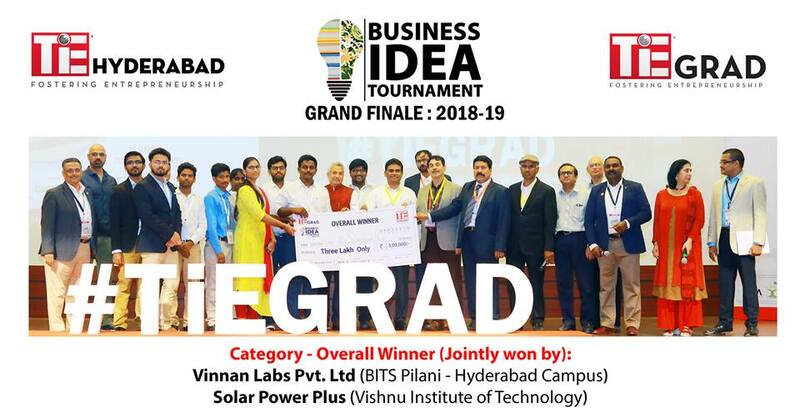 Entrepreneurship Development Cell is happy to inform that Solar Power Plus (SP+) Solutions formerly known as Team 8 won Overall championship jointly with BITS Pilani - Hyderabad inThe GRAND Finale of TiE GRAD Business Idea Tournament 2018-19 held on 9th March 2019 at Tech Mahindra, Hyderabad. 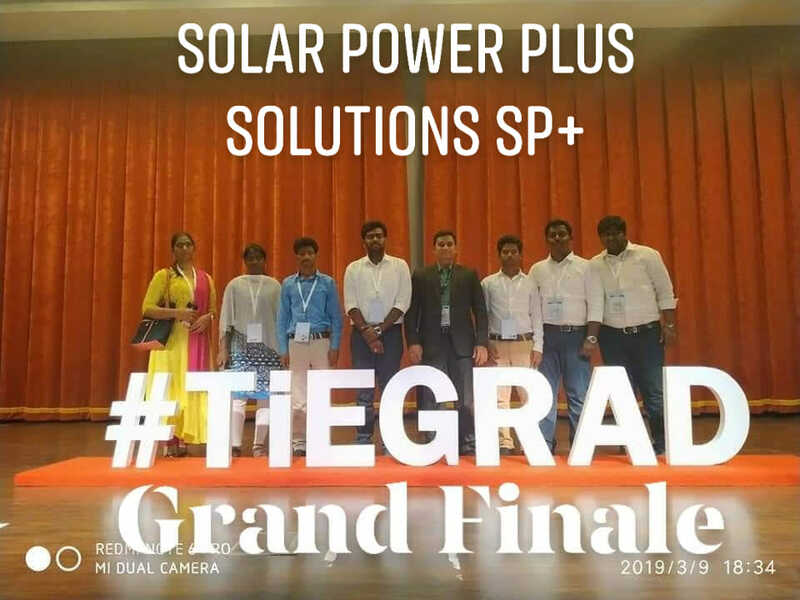 Winners received the Championship award and a cash prize of Three Lakhs from TiE by Mr. Suresh Reddy, TiE President, Mr. Subbaraju Pericherla, Tie Board member & Program Chair, in presence of Shri. Jayesh Ranjan, IAS and Shri J A Chowdary, IT Advisor to the chief minister, AP. 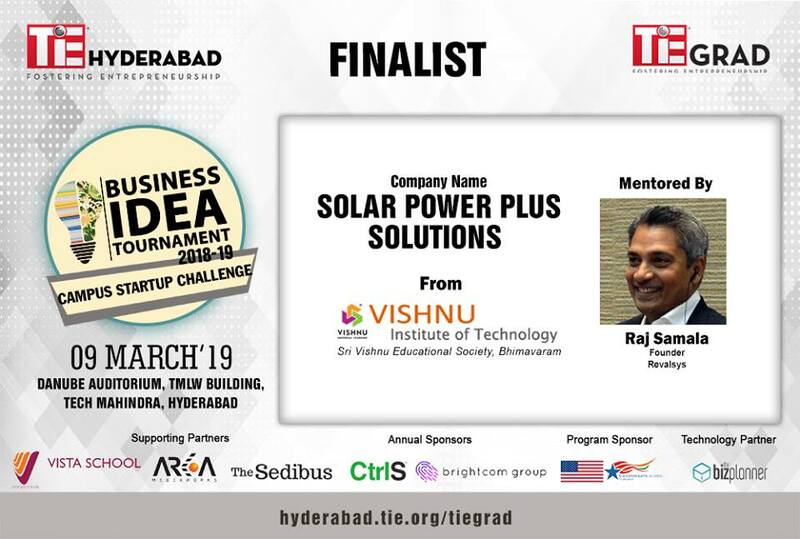 Dr. Dasika Suryanarayana, Principal & Director of Vishnu Institute of Technology Bhimavaram said, TiE announced the joint winners of 2ndedition of TiE Business Idea Grand Finale Tournament by Solar Power Plus Solutions for building an automated solar panel cleaning Technology with IoT technology and through an mobile app to control the board of our Institute along with Vinan Labs a team from Bits Pilani Hyderabad for designing HOMA Robot for reducing the infections by cleaning Hospitals. In this competition, 16 colleges around 2600 students participated from Andhra Pradesh and Telangana to compete for this championship. TiE granted three lakh prize money for the winners and also funds raised from the various investors at the venue. TiE also supporting these teams for establishing their own start-ups in the future. These teams also got a chance to participate in RISE competition which will be held in the USA soon. Winners received the Championship award and cash prize from Mr. Suresh Reddy, TiE President, Mr. Subbaraju Pericherla, Tie Board member, Shri. Jayesh Ranjan, IAS and Shri J A Chowdary, IT Advisor to the chief minister, AP. The principal of the college congratulates the Entrepreneurship Development Cell In charge and TiE Faculty Champion Mr. Mahaboob Hussain, the faculty mentors Mr. Chakravarthy and Gayatri Sharman for their contribution.